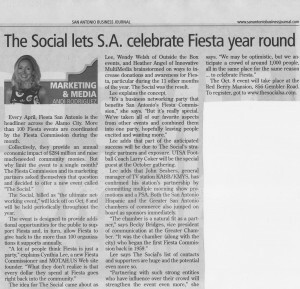 The Social featured in the SABJ! The Social, San Antonio’s premier networking event, is featured in this week’s San Antonio Business Journal! Check out the Marketing & Media section! venue to showcases the positive aspects of our community as well as raise money for the San Antonio Fiesta Commission and other local charities. The Social events include food, drinks, live music, and plenty of fun and surprises. Whether you are new to town or a San Antonio native, join us at our next Social networking event. You are currently browsing the Outside The Box Productions blog archives for September, 2009.